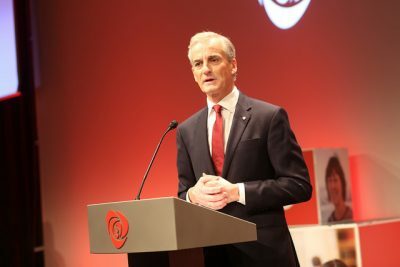 NEWS ANALYSIS: The Norwegian Labour Party and especially its embattled leader, Jonas Gahr Støre, have been clobbered by yet another rash of terrible poll results. They show how Labour voters are still fleeing to other parties, that Støre is far from favoured as a prime minister candidate and now, that less than half of Labour’s own members think he’s doing a good job as party leader. The latest numbers showing Labour’s ongoing decline were reported in newspaper Dagbladet this week, based on a poll it had commissioned from research firm Ipsos. Only 49 percent of Støre’s Labour Party fellows think he’s doing a good job as party leader, while just 25 percent of voters as a whole think the same. That compares to the 96 percent of the rival Conservative Party’s members who think their leader, Prime Minister Erna Solberg, is doing a good job. Fully 68 percent of the general public also think she’s a good leader for her party. As for her approval ratings as prime minister, 53 percent of everyone questioned in Ipsos’ poll think Solberg is doing a good job. The numbers continue a trend of how Solberg, through her first four-year term as prime minister and now two months into her second term, has consistently scored high both as party leader and prime minister. The new numbers are the latest in a long string of bad news for Labour. Other polls have been equally disappointing, with one last week (from Sentio Research for newspaper Dagens Næringsliv) showing the Conservatives now ranking as the largest party in Parliament with 28.2 percent of the vote while Labour slid from its election result of 27.4 percent to 25.6 percent. Newspaper Dagsavisen, which has long supported Labour editorially, went so far as to describe Labour as “on its knees” in late October. The party has also lost support from both labour union members and union leaders themselves, some of whom have openly criticized Støre, who responded that trade union federations didn’t do a good job of attracting voters during the election campaign either. Even Labour Party veterans like Rune Gerhardsen, son of Norway’s legendary Labour leader and Prime Minister Einar Gerhardsen, have criticized party leaders as have Labour politicians at the local level. There was also a lot of discontent when the party reorganized its delegation in Parliament and party leaders made some unpopular changes among committee leaders. There’s been a lot of soul-searching within the party this fall and Støre promised to “clean up” and revive it since its disastrous election results emerged in September, but there are few signs og revival yet. Dagbladet headlined its front-page story on the latest poll results this week as “crisis numbers for Jonas” based on comments from several election researchers and political commentators. “This is extremely serious and dramatic for both the Labour Party and for Støre,” Øystein JS Moen, a former Labour politician who works closely as a communications adviser for several of Norway’s largest trade union federations, told Dagbladet. Moen doesn’t think the party can regain voter confidence by simply making some repairs and adjustments. Even though Moen himself has his roots in Labour, he freely concedes that voters view the Conservatives’ Solberg as a “solid” prime minister. “The fact that a prime minister from the Conservatives has nearly double the amount of support from the general public than a prime minister candidate from Labour is extremely critical for the largest party in opposition,” he told Dagbladet. Beate Nossum, a former political editor and commentator who now leads consulting firm Footprint with positioning as her speciality, also called the loss of confidence in Labour and Støre “serious.” She doesn’t think Støre has managed to solidify his role as Labour Party leader and prime minister candidate after taking over for Jens Stoltenberg in 2014 when Stoltenberg became secretary general of NATO. “He was in good shape and seemed to gather the party together at its national convention (last spring), but he hasn’t managed to follow up even though he seemed strong during the election campaign,” Nossum told Dagbladet. Then he fumbled badly in its final spurt when hit with questions and revelations about his private fortune and investment interests, she noted. Labour ended up losing many voters to both SV and the Center Party. Their leaders also now enjoy high approval ratings among their own party members (85- and 79 percent respectively for SV’s Audun Lysbakken and Center’s Trygve Slagsvold Vedum). Another new poll by Ipsos backed by the political science faculty at the University of Oslo shows that more members of the working class who traditionally voted for Labour are also now voting for both the Conservatives and even the more conservative Progress Party. In 1965, for example, 64 percent of voters for both Labour and SV’s predecessor party SF described themselves as members of the working class, compared to only 5 percent of the Conservatives’ voters. Now just 32 percent of Labour’s voters and 19 percent of SV’s voters respond the same, while the Conservatives’ numbers have risen from 5- to 14 percent and fully 20 percent of Progress Party voters call themselves working class. Støre and Labour thus seem to have lost their grip, but Støre himself seems to be trying to hang on and remain optimistic. “All these numbers follow the election result, they’re not nice, but they’re not a surprise either,” Støre told Dagbladet. He believes he will still be Labour’s leader and prime minister candidate heading into the next parliamentary election in 2021. That may not be much comfort to those worried that Støre still doesn’t seem to appeal to enough voters, including longtime Labour voters, but Dagsavisen’s editorial writers were encouraged on Tuesday. 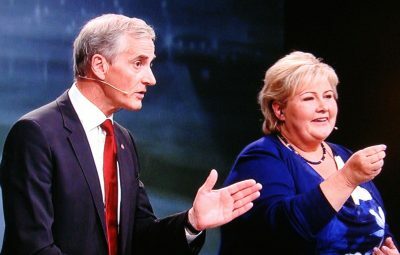 “It’s an important clarification,” the Labour-friendly paper wrote, that Støre intends to hang on, because “the last thing Labour needs is a divisive leadership conflict.” It claimed there is no clear candidate to challenge Støre either, since deputy leader Trond Giske is “controversial” and his fellow deputy leader Hadia Tajik lacks enough experience at the highest levels of politcs. Dagsavisen also urged Støre to forget a more centrist approach and adopt more clearly left-leaning positions on issues in cooperation with SV and the Center Party. That’s the only way to win back the working class and strengthen opposition to the government. Stoltenberg returned from Labour’s major defeat in 2001 to win in 2005 and win re-election in 2009. Some think Støre still has a chance to do the same.